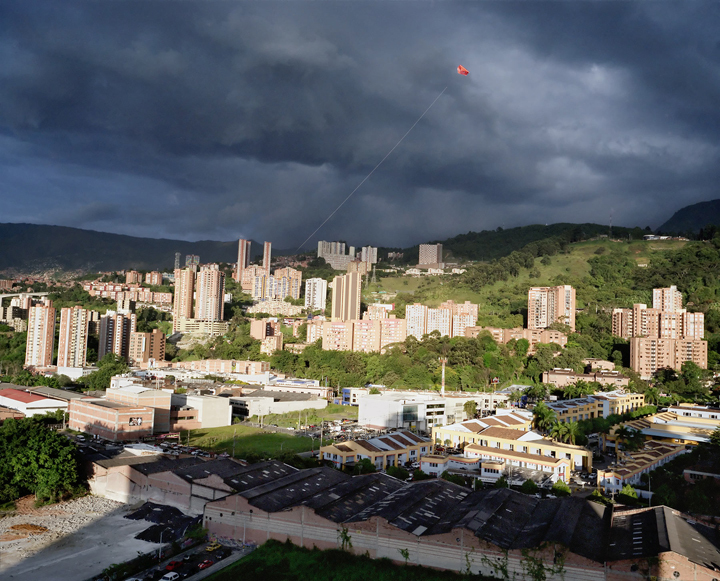 Moving from the states to Medellín, Colombia (his wife’s hometown) in 2010, Tom Griggs has photographed as a way to interact with his new home. Whether from far away or close up, with photos of friends, family or strangers, he has documented his experience in this new city, while balancing his feelings of both foreignness and familiarity. 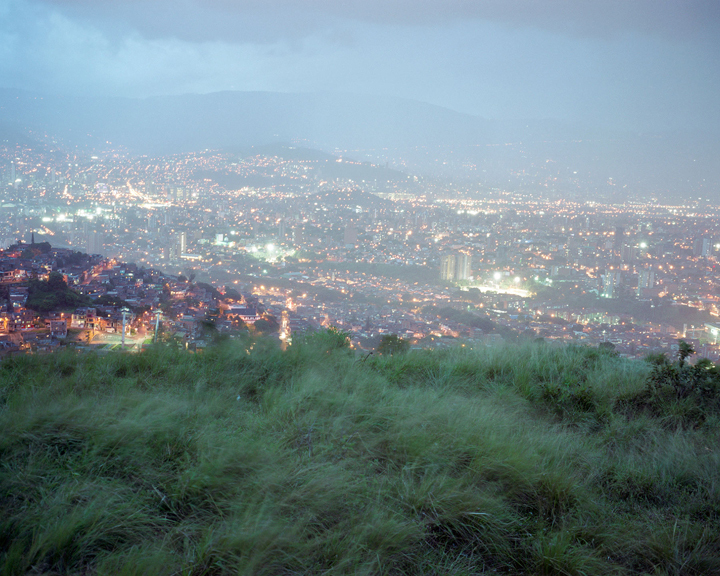 Abigail Smithson: What role has photography played in your move to Medellín, specifically with the work Untitled (the city of eternal spring). Tom Griggs: Photography for me is always a way to sharpen my vision in terms of what I pay attention to and how I experience space. If I move through an area with a camera I have a different interaction with it than I would have if I were walking without one. 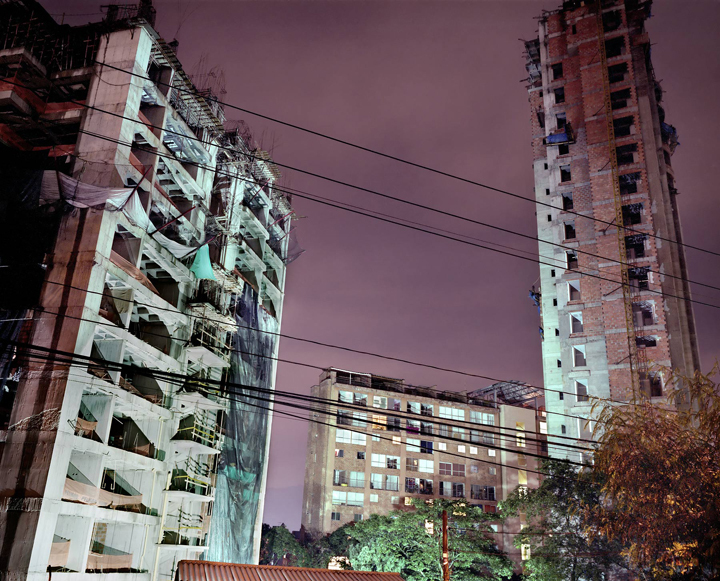 I have been wary of trying to make this project be about the city, however. I have a lack of faith in the idea that I can produce some type of document of the city that would treat it in a balanced way or really engage it in a complete way. It’s more about my experience of the city. It’s evolved to be a project about where self and place overlap, about my immigration, about “starting over” in a new country as an adult. Most of the photographs that I am working with now in the current edit are familiar people – students, professors, friends, my wife’s family – and familiar spaces such as my apartment and where I teach, as well as some very specific experiences with people that I have met when I have had my camera. As the city has reconnected to an international community and has gotten momentum with changing a lot of the problematic dynamics of its past, it coincides with my moving here and giving up a past life and also starting over again in a new place. That being said, while rebirth as a narrative is helpful in structuring the project, I don’t think in reality that rebirth is necessarily something that can actually be done in an absolute way. We are very tied to who we are and tied to our history and past. You can redirect where you go but I think this idea of a fresh start is perhaps a false one. It is interesting to play with rejecting that idea as part of how I build the project. AS: What ideas did you have about making images when you first moved here? TG: For almost the first year I was here I made a lot of images that related to older bodies of work. 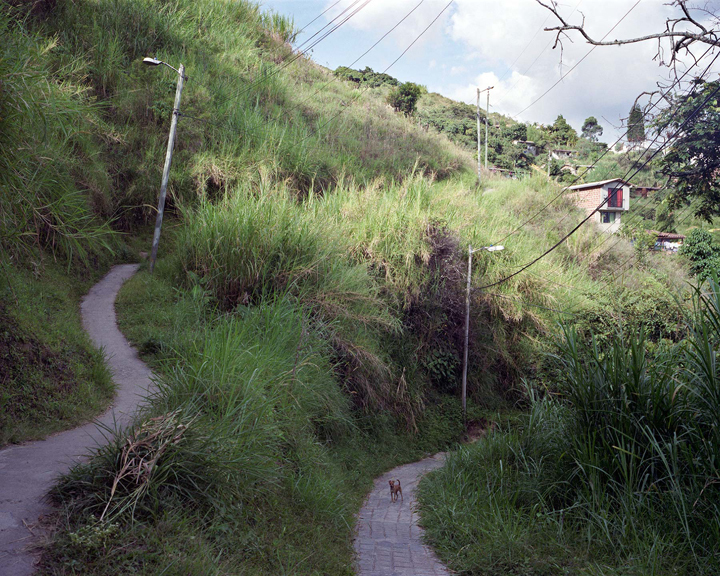 After about a year or so I started working on the images that we are talking about, that are more based within a concrete space – Medellín. This is the first time I’ve tried to do a project like this. In the past I worked with images pulled from many different places and times within one project. I try to make images without analyzing them in the field; editing is a separate process and separate understanding of the work. I created a lot of images during my first few years here, then I started to look through them and tried to understand why I am photographing what I am and see what I am attracted to, looking for themes and ideas that are embedded in the work. I have now begun trying to polish the ideas through editing and sequencing as well as making images that hopefully fill out the ideas. There are fantastic photographers that work from an idea, but that’s not the type of photographer I am or the branch of photography I come out of. Images first and the content comes from those images. That has been my process making images since I moved here and in the past. AS: Does photographing here make you feel like more of an insider or outsider? TG: Good question. Both. It’s an experience that makes me feel closer to where I am and who I meet and photograph, while at the same time it gives me a self-consciousness that makes me always a little bit of an outsider, even beyond what I would feel anyway as a foreigner. I meet people that I wouldn’t have a reason to meet otherwise and have experiences I wouldn’t without the camera. And I see parts of the city that I wouldn’t be in if I didn’t have an interest in photographing a person from that area or that area itself. It’s really the experience of meeting people and interacting with them and making images that drives my interest in this type of photography. And those experiences make me feel more of an insider. My wife jokes that I know her city better than she does. The experience of being a “maker” in the world – as opposed to the studio- is really the driving force with photography in general for me, and this project in particular. I want the work to be part of a conversation in photography, I want to show the work and I’d like to make statements that go beyond the experience of making it, but I just don’t feel that making that an end goal or something that I’d count on is very healthy for me. 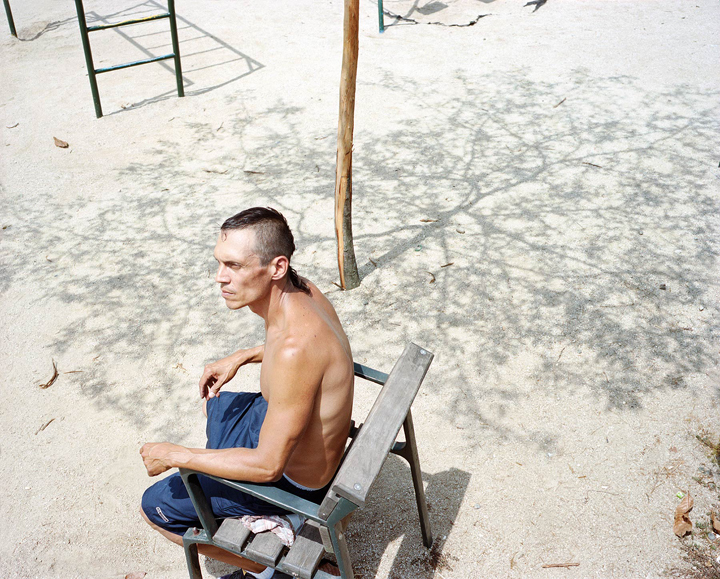 So generally I make photographs with the experience of making them as very primary to my practice. I should add that I think it is a great advantage for me not being from here in terms of photographing. That’s been my impression. There’s still a placement of foreigners on a pedestal in Colombia in general. I think that’s changing as the city gets more connected again with the international world, but I think that by being very distanced from the rest of the world for a long time, having very little tourism and few people from outside the country here, I think that people are interested in foreigners, especially foreigners with a big camera. They want to know why you’re here and what your experience has been. They want to hear that you’re happy here and that you’ve been well taken care of. Colombia in general is a very friendly place and Medellín is particularly so. Quick interactions can lead to invitations to dinner or a country house weekend or a bar. There is also, generally, a lot less attention paid to cameras here. There is not the same level of hyperconscious of image or self, of being put inside of an image. My experience is always a positive one. People are excited to be included or excited to be asked or wonder why them, so we have a good conversation. I would say if I’ve asked 500 people to take a photograph, I’d say 5 have said no for different reasons. It’s an incredible amount of participation that I am grateful for. AS: How do you feel about color in photography? TG: Originally coming to visual arts through painting, color has always been a particular interest, something I spent a lot of time studying. Also coming to photography without a lot of formal experience with it in school, I don’t think that I considered the questions about black and white and color the same way that maybe students who have come up through an undergraduate photography experience do. I bought a digital camera in 2005 without doing a whole lot of research on cameras and started making images. Analog or digital wasn’t a question I considered. Color or black and white wasn’t a question for me either. It was “I’ve got this camera now, I am going to make some photographs” and that’s how I started with it. In time, and moving through graduate school and now into teaching, those questions about format and color have come up for me. 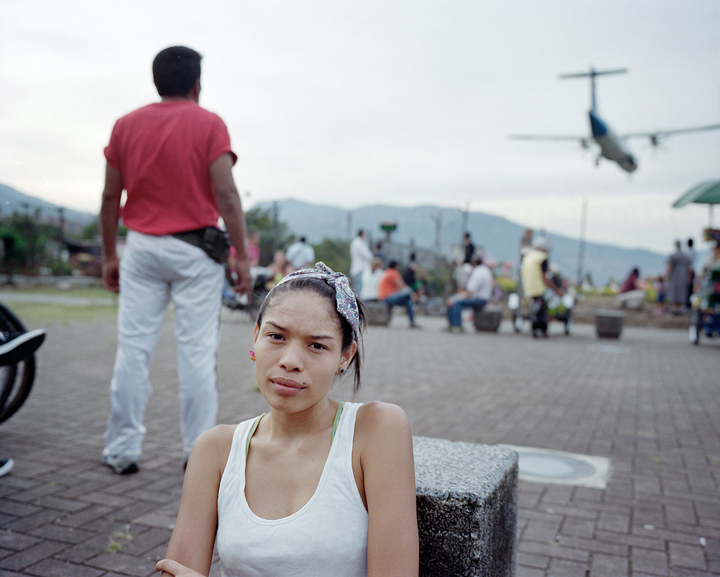 This project from Medellín is all analog, medium format. And there are reasons to do that. But I don’t think I have ever thought that deeply in comparison to a lot of other photographers about what kind of format and color vs. black and white. It’s always just been an assumption on my part that color is of interest to me; the way I was trained as a painter I think it’s color that I react to and that often generates my interest in making an image. I had a really great painting professor in a color theory class when I was in undergrad who talked about discovering your palette and what colors you respond to. I think that was a very helpful experience. That’s carried through into my photography a lot. Maybe it goes back to the question we were talking about earlier, about content, content as something that comes out of the work as opposed to creating something to impose upon your work. I think the same is true with color. I don’t think that it’s necessarily a chosen identity that this is the type of photographer I am and this is the pallet I am interested in. It’s more trying to understand my inclinations and refining them. AS: Are there days when you wish you had brought your camera and days when you wish you hadn’t? TG: Sure. I should probably take my camera with me everywhere just because of the nature of photography and the possibilities of coming across extraordinary things. But I had a conversation recently with an older, more established photographer who was telling me that he actually does not shoot nearly as much as I thought. That’s beginning to make sense to me at this point in my life. I think that these very concentrated periods of shooting and then taking some time away seems to be a good fit both for my resources, distributing my time and energy, this particular project and having a number of other things I am working on such as my site and also teaching. I think that those concentrated periods of shooting frequently allow me to be connected with the project in a way that strengthens it. Shooting is pretty much like any activity in the sense that once you are in the rhythm of it you start to see things in ways that produce stronger images. And also if you start making images, you begin to see a lot more photographs. That is not something I could sustain indefinitely and keep a roof over my head and enjoy life. So I don’t carry a camera all the time unless, perhaps, I am in one of those cycles of shooting a lot. Another reason I don’t always carry a camera is because at least as far as taking pictures of people, I have gotten away from doing the hit and run or street photography style where I don’t have interactions with people. I think over time as a person and as a photographer that has come to feel like an empty experience. I don’t feel fulfilled by it. I have gotten more interested in using photography for connecting to people, having some experience with them and making a photograph. I have come to a point where I would like a more extended and deeper experience of fewer things than a lot of experiences in a superficial way. When you’re younger, I think you want this multiplication of experiences. As you get older, I think frequently depth comes with division of a smaller range of experiences, whether we’re talking about photography, relationships or friendships. I feel like as a photographer that is where I am moving, these more extended interactions with fewer subjects in a limited range and I have less interest in photographing all the time and everybody and everything, photographing somebody who never knew I took their picture. It’s not where I am right now. AS: What role do you believe luck plays in photography? TG: Luck is part of photography, but I think it is a superficial element of photography that relates to form. And form alone is boring photography. I think that an example that others have used is that if I took twenty minutes I could probably write two lines as great as Pablo Neruda and give them to my wife and she would be really impressed. But for me to put together a whole poem, I can’t do that the way he could, much less a whole book of poems. That is to say, anyone can get a single image that can be fantastic but trying to duplicate that experience through a lot of images and then have the intelligence to tie together images in a way that speak beyond the forms, that’s not possible with luck. I don’t think photography is about single images outside of photojournalism. I think it is about using it as a language to have conversations, develop ideas, and present arguments over extended sequences or bodies of images. I can love a single image; it involves this coming together of elements, which is a very satisfying feeling. To see every element in it’s place within a frame, that feeling of making the image, when all of a sudden within the camera everything comes together is the drug that addicts a lot of photographers. And seeing that in someone else’s work is also a generative force for making more images yourself. It is almost a biological response, a sense of the chaos of the world coming together in a very pleasing way. There are thousands upon thousands of photographers who can do that really well – or perhaps I should say “equally well to each other” – however. I think that the hard part is understanding what it is about your life and experience that can drive you beyond thinking in a formal way with the camera or capturing a moment or getting those lucky, great shots. Let’s just take it for granted now that images should be well built formally inside of whatever their aesthetic lineage is. Now how can you use those images to express ideas about life? How can you hold a charge between you and your audience? How can you sustain it across 60 images in a book or exhibition while building your ideas and themes? So yeah, luck is part of all of life, in encounters and photographs and life and love and death. The everyday is filled with luck. There is a lot of randomness to life. Having met you and sitting here with a coffee and talking in another country together is based on incredible luck! And some of my images come together through luck and I accept those moments when they’re there and I keep pushing when they’re not and I try and weave those images all together into something that moves beyond those lucky moments. To see more of Tom’s work, please click here. 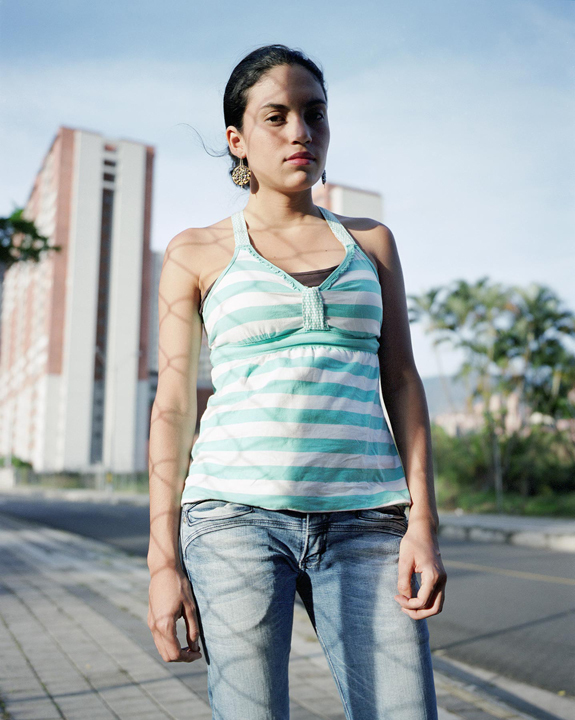 Also, be sure to check out his site Fototazo which combines social giving, photography and support for young photographers from Colombia.